Dress up a plain plastic mask into a fun Jack-o-lantern pumpkin style this Halloween! Remove the elastic cord from your mask and put aside for a later step. Paint your mask in 2 coats of paint, the first with orange Acrylic Paint and the second with orange Glow in the Dark paint. Once dry, use a pencil to draw a design on the mask. We chose a Jack-o-lantern theme so we drew triangular shapes around the eyes. Paint in your penciled design using black Acrylic Paint and black Glitter Paint. Use your hole punch and punch a hole through the mask. Thread a green Fuzzy Stick through the hole then twist to secure. Bend and fold the ends to create an oval leaf shape. Twist both ends together to finish the Pumpkin Stem. Take your elastic cord from Step 1 and tie a loose knot at one end. Thread Pony Beads onto this cord. Once complete, tie back onto your mask. Accent your mask with Peel and Stick Acrylic Jewels. Paint other masks with similar materials for your friends! 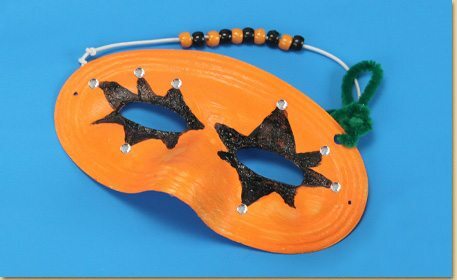 Tip: You can also create masquerade style masks by removing the elastic cord and gluing your mask onto a decorated Wood Dowel handle like the black mask shown here!